In Small Things Remembered » The staff of American diplomat Charles W. Thayer. 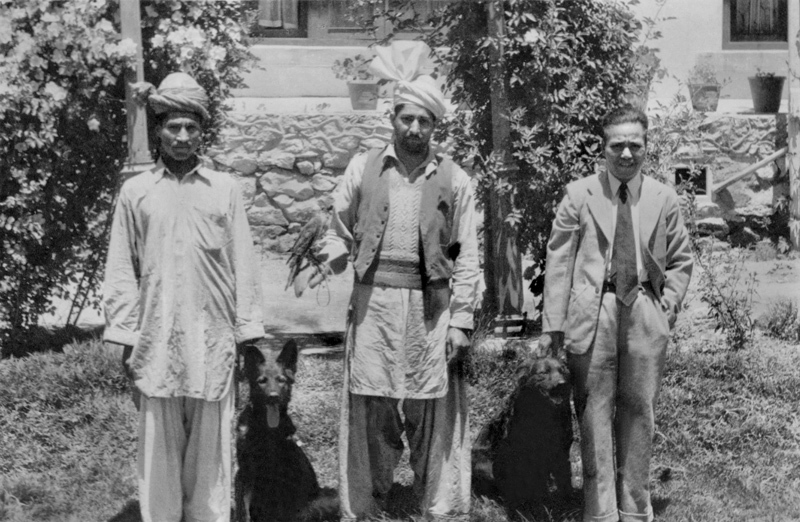 L to R: Afghan cook; Abdullah, the Court falconer; Thayer’s butler, Yang. Thayer played a key role in organizing the first U.S. diplomatic mission in Kabul, but spent much of his free time learning about local customs. Long interested in falconry, he befriended the Court falconer and dedicated many hours to this ancient sport. One of the dogs seen here is probably “Midget,” Thayer’s prized Belgian shepherd, who was paired with the King’s German shepherd to produce a litter of five “royal” puppies. Courtesy of the Harry S. Truman Library. Charles W. Thayer Papers. 2008-1112. Photograph by Charles W. Thayer.